SmartThings and ADT give customers easy-to-install, high-quality equipment, flexible monitoring options, and affordable monthly prices. However, up-front equipment costs are high and the warranty is short. Plus, although there are convenient customer resources in the app, we still don’t have a lot of information about customer experiences since this product is so new. The list of devices that work with home automation platform SmartThings seems to get longer every week. You can use SmartThings gear to sync and control lightbulbs, door locks, security cameras, speakers, and smart outlets—and now SmartThings equipment can help you protect your home. 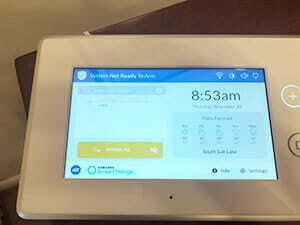 SmartThings recently teamed up with ADT to offer a streamlined, flexible home security solution. But are the up-front equipment costs worth the convenience and flexibility? Keep reading to find out. What makes this unique partnership special? 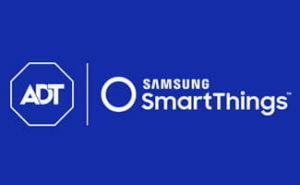 ADT has been in the home security business for decades but just joined forces with a relatively young company—Samsung’s SmartThings—to offer traditional professional security system monitoring with a more modern twist. 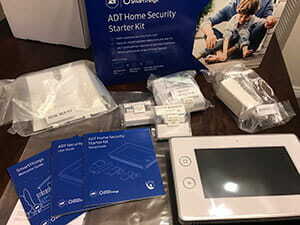 Now you can get ADT home security equipment that pairs with SmartThings home automation devices. Plus, you can opt in and out of professional security monitoring service as your needs change. The biggest advantage of this setup is the flexibility it offers you—but we also appreciate the nearly endless home automation options and the simplified monitoring sign-up process. Professional monitoring provides a level of security that you can’t get on your own—if an alarm is triggered and you aren’t around to do anything about it, professional monitoring means that help will still get sent as quickly as possible. Monitoring your system on your own is certainly better than nothing—but it does come with more risks. However, while professional monitoring may be ideal, it simply isn’t in the budget for everyone. We love that ADT and SmartThings have made home security accessible to more people. Now you can get professional monitoring when you need it without being locked into a long-term contract. If you’ve got room in your budget, you can keep the professional monitoring on all the time—if not, you can sign up for monitoring when you know you’ll be out of town for an extended period of time, and then switch back to monitoring the system yourself the next month. 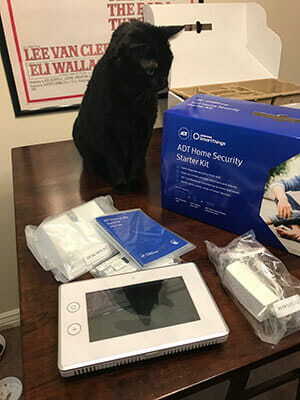 The special ADT hub that comes with this security kit still works as a SmartThings hub, so you can use it with all the things that would be compatible with a normal SmartThings hub—and to be clear, that is a nearly endless list, so you’ve got tons of options whether you want to control lights, cameras, speakers, or door locks. If you decide you want the optional professional monitoring, you can sign up for it in the SmartThings app. That means you don’t have to deal with a high-pressure sales pitch or wait on hold for 20 minutes for an available representative. You can just pick the monitoring plan you want and sign up on your smartphone inside the app. How does SmartThings and ADT’s system compare to the competition? The SmartThings ADT home security kit is most similar to products from Nest and SimpliSafe. All three offer basic home security and no-contract professional monitoring. Nest’s new home security system comes with similar security sensors and lots of home automation compatibility, but professional monitoring is through Brinks instead of ADT. SimpliSafe’s security sensors are similar, but you won’t get any home automation options. We should also point out that you can purchase more equipment à la carte if the kits don’t have quite what you need, but you’ll have to get the ADT Security Hub for any of the other equipment to work. Monitoring price $14.99/mo. $24.99/mo. $34.99/mo. We had the chance to test this equipment ourselves, and overall, we’re happy with it. The hub is easy to use and displays helpful extra information like date and weather conditions. You can quickly arm or disarm the system from either the app or the hub. The hub has to be mounted on a stand, which isn’t difficult, but we’d love to see a built-in kickstand in the future to make it even easier to set up. The motion sensor worked just like we’d expect. It detected people walking in and out of the room throughout the day but didn’t go off when small animals wandered in and out. The door and window sensors were simple to install—you just peel and stick. And we were happy to see that they worked even if the door frame wasn’t perfectly flat. 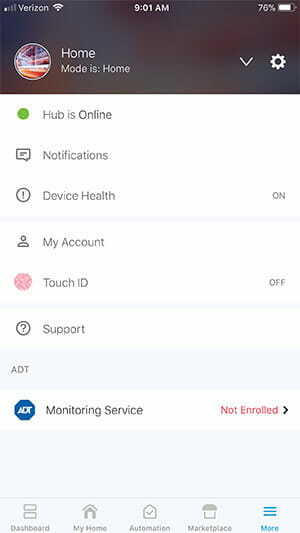 You can use the SmartThings app to control your ADT sensors and all the other home automation devices you’ve connected. The app itself has intuitive controls and a clean layout. It was easy to find settings and look up specific devices. We also liked that the app included device-specific setup instructions. The app also makes it easy to check in on your house remotely. You can see whether the doors are currently open or closed and whether the motion sensor is inactive or active. You can also check the sensor’s history in the app to see when things happened. If you want to control your system without constantly opening the app, you can choose from a preset routine or build your own set of instructions. Plus, as mentioned earlier, if you want professional monitoring, you can sign up for it in the app instead of talking to someone at a call center. Samsung SmartThings and ADT have built a little home security system that is an excellent compromise for customers who don’t like long contracts, expensive install fees, or talking to sales reps on the phone. Although initial equipment costs are more than you’d face from some competitors, we think the flexible monitoring options and easy-to-use equipment make the up-front investment worth it. We’d recommend this system to anyone who wants lots of home automation compatibility and the option to turn professional monitoring on and off from one month to the next. If you’re looking for a more robust security system, though, check out Frontpoint or Vivint. Have you purchased this home security system? We’d love to hear what you think. Share your experiences in the comments below.